It really is like Christmas in November, as an announcement from the Federation of Genealogical Societies (FGS) gives the genealogical community something to be oh so thankful for here on this first day after the Thanksgiving holiday here in the United States. The pipeline is flowing again. The wonderful crowdsource-funded flow of images of pension documents from the War of 1812 is once again moving forward. It’s baby steps forward to be sure — images through the surname Moore (through William Moore, to be precise) have now begun to appear on the Fold3 website that’s free for us all to access — but any movement forward, seeing the pipeline begin to flow again — is Very Good News indeed. 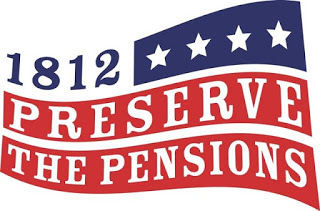 So many of us contributed our funds and our time towards raising the money needed to ensure that all of the millions of pages of records of War of 1812 pension records held by the National Archives could be protected and preserved — and made available — for the future. Through the Preserve the Pensions project, the Federation of Genealogical Societies (FGS) spearheaded this drive to digitize these oh-so-fragile documents that are in grave danger of deterioration. The records documenting more than 180,000 pension records for War of 1812 soldiers and their families are among the most heavily requested documents at the National Archives and, because of their use, their age and their fragile nature, they really need to be digitized to protect them forever. FGS began the project, with matching funds support from Ancestry, and the way it works is that every image digitized becomes available, free, to the public, forever. The pensions for surnames from A into M went online steadily. And then… and then… All of a sudden, we were stuck in the Ms.
That explanation, back in August, held out some hope, as the FGS President said new security systems had been put in place and conservation work — the first step towards digitization — had resumed for the records. Now we have the very first tangible evidence of progress on the digitization front: the first few new records with M surnames are now up on the Fold3 website. This won’t be an overnight deal — progress will almost undoubtedly be slow (and slower than any of us might have wanted)… but at least now there is real visible progress in bringing the remaining pensions online — and all of the M-Q surnames may be completed as early as May 2018, with the remainder of the alphabet to follow. Keep checking the Fold3 website as new records go online. Maybe for you and your family (have a William Moore to look for???) there will be a big Christmas gift here in November. And for the whole community seeing any progress again in getting these records online is at least a little Christmas gift here in November as we watch the pipeline once again begin to flow. Thank you for the update, Judy. It is exciting news. The records I am waiting for are further along in the alphabet, so I’ve got a wait yet. But I can be patient. I am just very pleased and grateful that these records are being digitized at all. I’ve found the people I need in the index card database, and have a feeling that when we can finally access the pension records that I’ll be able to break a huge brick wall and settle some identity questions once and for all. Thanks to you and everyone who put time and money to help make this happen.